Wow! The amount of snow we experienced was amazing. Hope everyone was able to stay warm and safe. Tonight the School Board is voting to change the 4j calendar and the Connections calendar to make up the missed school days. Please make sure you check the calendar link above to see the changes. Hope everyone was successful with their February challenge goals! This Thursday and Friday there is a Statewide Transition Conference taking place in downtown Eugene. Anders, Jasmin and Lori will be attending and various students will participate at prearranged times. Birdie will be subbing and classes are taking place as scheduled. 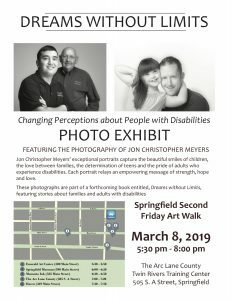 Anders and our former student Kyle M will be part of the Dreams Without Limits photo Exhibit this Friday in Springfield starting at 5:30pm! Check it out and support this project. Click on the picture the see the details. This entry was posted on Wednesday, March 6th, 2019 at 7:39 pm	and is filed under Uncategorized. You can follow any responses to this entry through the RSS 2.0 feed. You can leave a response, or trackback from your own site.